Well, yes, the hide is kind of smooth if you stroke it one way but then again, if you go against the grain it’s like sandpaper. Which I learned when Elvis grabbed a six-foot-long silky shark in about 30 feet of water and brought him up to the surface just so, you know, I could have a look at him. 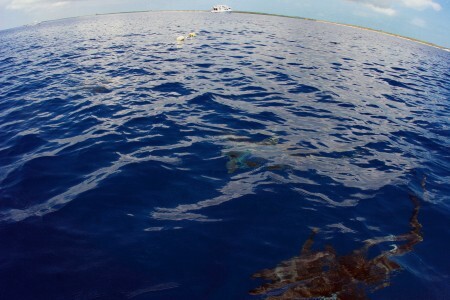 Since I wasn’t diving like the rest of the boys, my job was to cut up a large red snapper that Elvis was going to feed to this school of circling sharks. Presumably after everyone got out of the water. 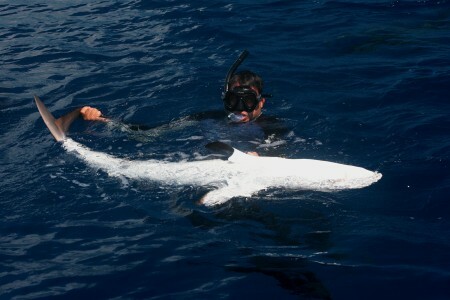 Elvis brings up a silky shark. Photos by David Lansing. As I rubbed my hand along the belly of the shark which floated upside down on top of the water as Elvis held its tail and head—sort of like you’d support a toddler just learning to swim—I asked him if these things were dangerous. I love that. Usually, no. But maybe sometimes, yes? 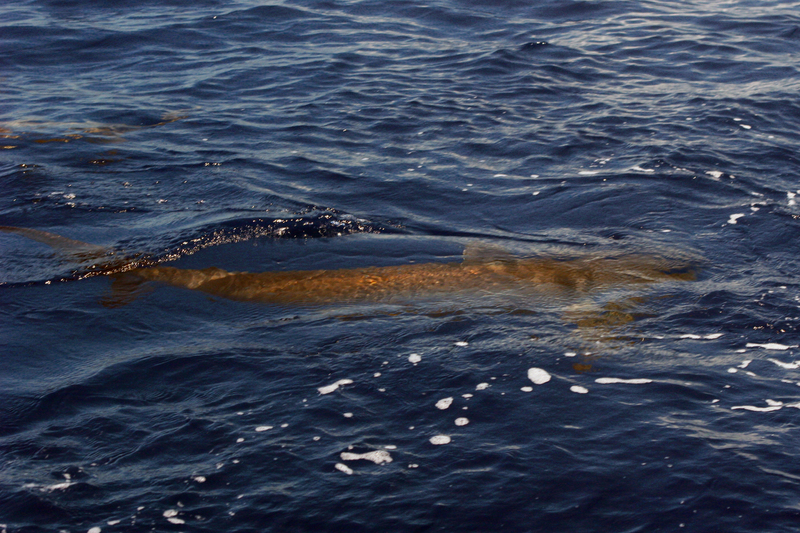 A silky shark waiting for me to give him a snack. So Pedro has his shark up on the surface and is petting its stomach and Elvis has an even bigger monster next to the boat so I can reach over and feel it and in the crystal clear waters of the Jardines I can see Hardy and Fletcher at a depth of maybe 20 feet with four or five other silky sharks circling around them. 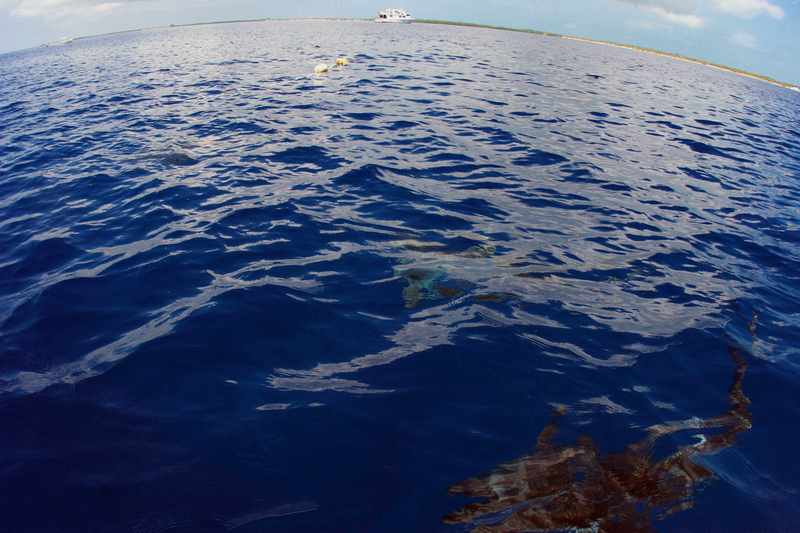 In the foreground, two silky sharks just beneath the surface. Gosh, I’m so disappointed I’m not diving. Eventually the boys get tired of playing with sharks and hop back in the dive boat. While they’re taking off their masks and regulators, Elvis casually grabs a big chunk of raw fish and tosses it in the water a few feet from the boat. 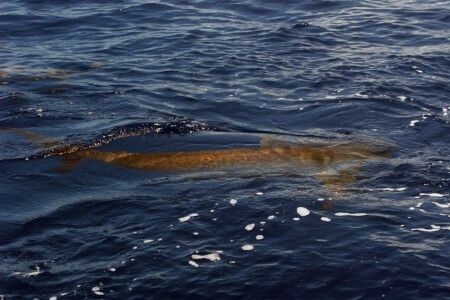 Something that looks like Jaws comes out of the water like a torpedo and ravishes the fish, swinging it back and forth in its mouth like a dog with a large steak. “Did you see that?” Pedro says, laughing. Then Elvis takes an even larger chunk of the red snapper, ties it to the end of a long wooden pole, like a broom stick, and holds it about six inches above the water. The water explodes. Not with just one shark but three or four. They almost rip the pole out of Elvis’ arms. “Are those the same sharks we were just diving with?” Hardy asks. “Yes, of course,” says Elvis. He takes the remaining scraps and tosses them out on the water. The surface is thrashed and looks like someone just dropped a couple of M-80s into the water. Uhmmm, yeah. I think so.